Something smells a bit fruity down at Trinity Mirror’s south east titles – as the papers trial a special pineapple-scented ink to promote a food festival. 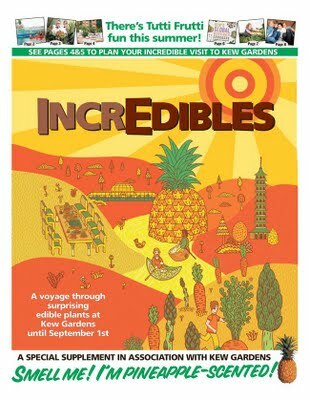 In what is thought to be an industry first, the Ealing Gazette, Fulham Chronicle and Hounslow Chronicle hit the shelves on Friday with the aromatic eight-page supplement advertising IncrEdibles, a festival aiming to improve awareness of edible plants. Pages one, four, five and eight of the supplement were printed using the specially-designed pineapple ink. Gary McNish, managing director of Trinity Mirror’s regional ad sales arm NASa, said the project had come together with work from the editorial, IT and Watford press hall departments, plus agency Arena Media. “We wanted to bring this fantastic festival alive – and what better way than making our newspapers smell good enough to eat?” he said. The IncrEdibles festival showcases around 12,000 edible plants from around the world, with the pineapple as the focal point of the event. It is open until 1 September. Didn’t Grimsby telegraph do a scented paper not so long ago though? The Grimsby Telegraph produced a paper which supposedly smelled of bread in May of last year. Someone really should be talking to Harry Ramsdens regarding a sponsorship deal. Smells like desperation to me!